Cooling towers are everywhere. From power plants to hospitals, they provide heat dissipation for air conditioning systems, reactors, mining equipment and more. Since 1958, Lakeside Cooling Towers has built these critical structures for clients located anywhere from New Zealand to Sudan. The consummate CAD collaboration tool, IronCAD has revolutionized Lakeside’s development cycle by streamlining design, production, assembly, sales, and marketing. In 1958, pencil-and-paper drafters designed all of Lakeside’s cooling towers. Production and assembly built them from these plans. Marketing used conceptual drawings and photographs to make collateral material. And salesmen relied on savvy to close deals. 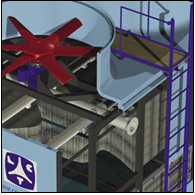 “You can’t put a 2D CAD drawing in a brochure and expect clients to understand it,” says Michael Able of Lakeside Cooling Towers. “We needed artists to make conceptual drawings and photographers to take detailed site pictures. And sales people couldn’t take CAD into the ﬁeld to aid in sales like we do today. I can only thank IronCAD for the increased business Lakeside has now,” he continued. Today, Lakeside uses IronCAD as a CAD collaboration tool to build cooling towers on-site with clients. Designers take conceptual models and reﬁne them into detailed production models. Rendered versions of these models are given to clients for ﬁnal inspection. Marketing then uses these same images to create brochures, direct mail pieces, and other collateral materials. Everything comes from one ﬁle. From sales to design to marketing to production, Lakeside Cooling Towers has streamlined their development process with IronCAD, a CAD collaboration tool that has the potential to involve multiple departments in the design process and extend the use of design content and data across the organization. Lakeside’s latest cooling tower designs are modular. This means towers can be assembled on-site or pre-assembled at a factory. IronCAD catalogs are a perfect match for modular products because each piece can be designed by an engineer and later assembled in 3D by anyone, regardless of their CAD background. In Lakeside’s case, a salesman can quickly generate a customized cooling unit for a customer by dragging and dropping pieces from different catalogs. From this model, hi-resolution renderings can be made and emailed to clients for their approval. New CAD collaboration tools also make it possible to embed 3D CAD ﬁles into websites for customer viewing online. “IronCAD is a model of efﬁciency. Once the sales department closes a deal, the same model they built as a concept for the customer can still be used. In many cases, it’s either reﬁned or used as-is. IronCAD generates a bill of materials and 2D drawings we can pass to production,” says Able. Two–dimensional drawings and bills of material can be generated from any IronCAD scene ﬁle. Both these items are fully associative, so any changes made to 3D geometry is reﬂected in the 2D drawing. These same drawings can be annotated to help production understand a design. IronCAD’s inﬂuence as a CAD collaboration tool even stretches to product assembly. Whether in the factory or on-site, IronCAD can generate detailed assembly instructions using different 2D drawing views or compile animations using 3D geometry from a model. This allows untrained workers to participate in the assembly process, reducing setup costs for Lakeside Cooling Towers’ clients. Demonstrating building simplicity is another ability IronCAD has. 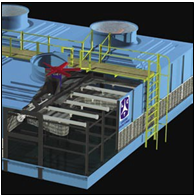 When Lakeside representatives are not available to supervise construction, a combination of drawings and animations are given to clients to ensure that the on-site assembly of their cooling towers ﬁt their needs. A powerful CAD collaboration tool, IronCAD has put Lakeside Cooling Towers at the forefront of their industry. 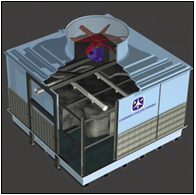 Through the effective use of existing resources, Lakeside’s designers are crafting the future of cooling technology by innovating with IronCAD, which has increased Lakeside’s productivity, improved communication between the company and its customers, and helped it mature into an international provider of cooling tower units.